The Connecticut Termination Form is a method one of two parties in a leasing contract may express the desire to terminate the lease when allowed. The State of Connecticut takes living arrangements solidified by a written lease very seriously. It is in this spirit that while lawmakers take into consideration that while one can terminate such an agreement (depending on lease type) at certain times, this will have a powerful impact on the remaining party. No Statute – There is no State law that requires a minimum time-frame for sending notice. Therefore, the notice should be sent in accordance with the language in the signed rental agreement. Thus if a month to month lease requires thirty days’ notice before termination, this must be obeyed. Similarly, while a roommate lease agreement may have a fixed term, it may call for a specific number of days’ notice from the departing party (before the end of the term). Such, requirements must be obeyed since both parties have acknowledged and agreed to them. However, even if this is not required, giving a substantial amount of notice is always a good idea as it will promote a smooth transition for all involved. Step 1 – Check the first box, then enter the date on the lease document and the date the lease should be terminated. Step 2 – The landlord must sign and print his or her name at the bottom. Step 1 – Check the second box, enter the date of the agreement being terminated and, enter the date the lease the lease shall terminate. Step 2 – Enter the mailing address (street address, city, state, and zip code) where the tenant may receive the security deposit after moving out successfully. 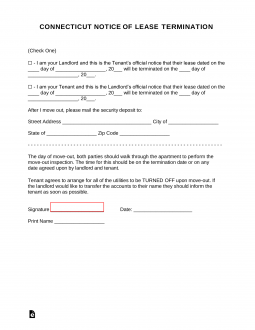 Step 3 – The tenant must sign and print his or her name at the bottom.